Our garments are all handmade in our Australian atelier styled specifically to your shape, to your top and bottom size (as these can and usually do vary) as well as your height. We apply these specifics in order to achieve a perfect fit for you. As we specialise these attributes we cater to making the garment fit to the correct length, the correct comfort in every aspect you desire, so if you happen to be sitting in between sizes we will accommodate you to a T. When placing your order, please do select from the sizes guides available. And feel assured we cater to XXXS to XXXXL and any variation in between. The table below is simply a guide to general sizes. We have provided a measurement guide charts below. Once you have measured yourself, please put these measurements in your order, and one of our production staff will be contact with you to discuss your made to measure order with you personally. 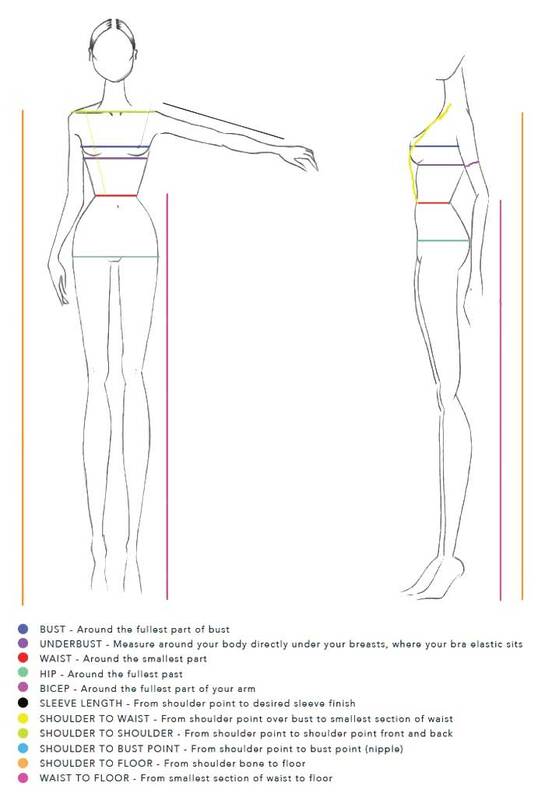 If you feel your shape/size proportions sit outside the standard then please do not be concerned, we will go through these variations with great care.